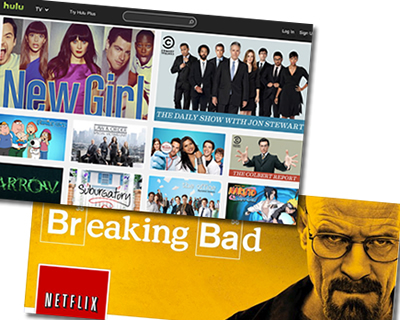 Netflix, Hulu and Hulu Plus allow for what one could call Catching Up TV. What we mean by this is that there are so many television shows being produced nowadays that no one can watch them all first run. Especially the working folks who don’t have the time to watch episodes of all these shows. The only thing available is sites like Netflix that are a repository for so many of these shows that given time they can be watched at one’s leisure. For example let’s say one hasn’t seen the Marvel’s Agents of S.H.I.E.L.D., during its first season. Well now you can watch it on Hulu and catch up on all the action and adventures of your favorite characters. The same goes for many of the popular shows and shows trying to get noticed. Another great show that has a cult following and a bag full of awards is Breaking Bad, the story of a chemistry teacher who cooks meth when he finds out he is dying of cancer. You’ve got Grey’s Anatomy, Revenge, Almost Human, Dads, The Middle, The Simpsons, K&P, Sherlock, and The Taste to name a few. One might know of some of these shows but not all. They feature stars who have become household names and up and coming stars that you can get the inside look at their beginning talent. Overall, these streaming video websites are doing a great job in keeping these series alive and available to the public. It builds constant revenue streams and pushes for more quality content to be produced. This allows for more employment in the industries involved which is a good thing. So here we have great and abundant entertainment at the click of a mouse and keeping the country’s economy and workforce active. Russia Next For Hulu And Netflix Streaming?